Deputy Commissioner, Tinsukia Recruitment - 22 Posts - Mandal: In pursuance of Govt. letter No RLR.14/2017/19 dtd 5/3/2018, applications are invited in the Standard Form as published in the Assam Gazette in Part-IX from the intending citizen as defined in Articles 5 & 6 of the Constitution of India for filling up the following vacant posts under the establishment of Deputy Commissioner Tinsukia . Name of Post. – Mandal. Educational Qualification: Minimum H.S.L.C. passed or an equivalent Examination of Recognized University or Board along with 6 months Recorders Certificate Course Class Training from Assam Survey &Settlement Training Center, Guwahati, certificate of experience in recorders activities. Pay: Pay band Rs. 14,000.00 to 49,000.00 p.m, plus other allowances as admissible as per rule issued time to time. 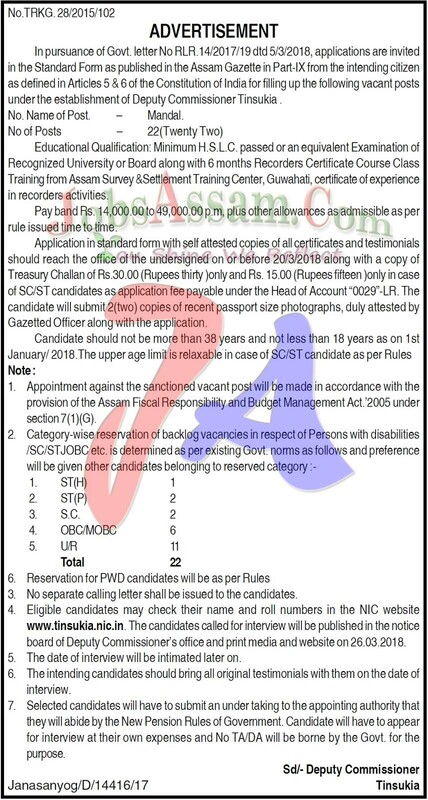 How to Apply for Deputy Commissioner, Tinsukia Recruitment - 22 Posts - Mandal : Application in standard form with self attested copies of all certificates and testimonials should reach the office of the undersigned on or before 20/3/2018 along with a copy of Treasury Challan of Rs.30.00 (Rupees thirty )only and Rs. 15.00 (Rupees fifteen )only in case of SC/ST candidates as application fee payable under the Head of Account “0029”-LR. The candidate will submit 2(two) copies of recent passport size photographs, duly attested by Gazetted Officer along with the application.